First, look at the table below. HollandCodes.com has developed a Holland Code Assessment Test Rating Table. Second, use our NEW! 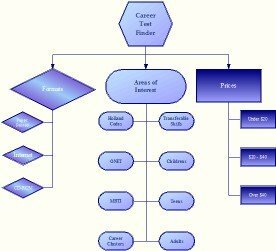 Career Test Finder. There are so many tests to choose from! Career tests are listed by format, prices, and interest area. We have simplified the process of finding the right test. Third, teachers and counselors, find career tests and tools sorted by Grade Levels. Fourth,if you need assistance finding the right assessment, the HollandCodes.com Research Team can help you find the right assessment. If you need additional information before you purchase an assessment or resource, call us at (602) 569-1050 or complete the form below. We will be happy to give you our recommendations. The Self Directed Search has been widely used by over 22 million people worldwide. The SDS has been translated into 25 different languages and has been supported by 500 research studies. There are three versions of the Self-Directed Search - Form R, Form E, and Career Explorer. With each purchase of the Make a Career Profile, we recommend that you purchase the Unlock the Treasure Chest,a step-by-step guide to explore careers and college majors. Myers-Briggs Type Indicator Career Report - Most Widely Used Personality Assessment. The Myers-Briggs Type Indicator (MBTI) assessment is the most widely used personality assessment in the world – more than 2 million assessments worldwide each year. Order Myers-Briggs Type Indicator (MBTI) Career Report. Strong Interest Inventory Assessment - Most respected and widely used career planning instrument in the world. Order Standard Edition for Adults.